A helpful map to guide your travels. KC Streetcar Constructors will work the weekend of June 27 on two of the last segments of track. Work will require the short-term closure of Main Street and East 9th Street. On Saturday, June 27, 6:00 a.m. until 7:00 p.m., Main Street between 8th and 9th Street will be closed due to track construction. Additionally, 9th Street will close between Main and Walnut starting Saturday, June 27 at 6:00 a.m. until Monday, June 29 at 6:00 a.m. 8th Street will remain open this weekend. With so much streetcar construction downtown, traveling in and out of the Central Business District can be tricky. There are crews working on the northbound track from 8th St to 12th St, constructing track and pouring track. Crews are working on electrical components of the streetcar all along Main St from 10th to 13th St, and roadway and intersection restoration is happening at 13th and Main. Here is a map pointing out the work zones and related street closures. 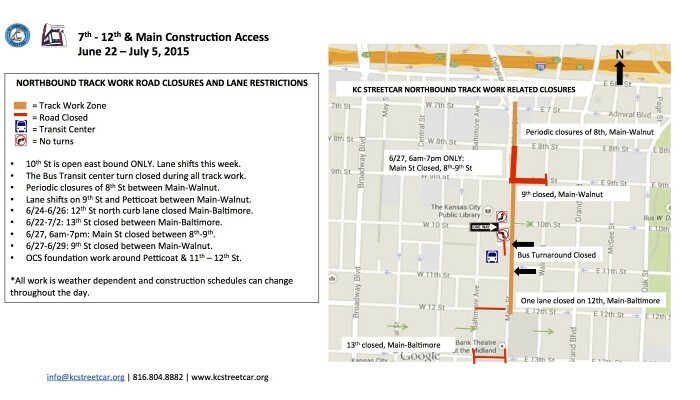 Street closure and work information current for June 22 – July 3, 2015.